This Make-do is a pattern from a Needl’ Love booklet and at least 5 years in the making. I started it years ago then stalled when I couldn’t find navy ribbon with stars. Several moves later I unpacked it and it’s been staring at me for months. Finally I decided to make-do with what I have and fashioned a ribbon from a piece of cotton fabric. A few hand stitches later it was a project complete! Yeah! The madness continues, a new book and the first installment, French Market Flower. Christmas gift giving has significantly changed in our house. Except for the girls, we have eliminated most of the expensive gift giving. Instead we have opted for smaller tokens and hand made “treasures.” This year the extended family and some friends received a wrapped bottle of Governor’s White from the Williamsburg Winery and a Christmas Pie Ornament, made from wool and nestled in a canning jar lid. I completed a year of pinkeeps with the Cottage Keepsakes book. They are addictive and I love these little guys. So glad they came out with another book too! I have a new love…pincushions! They are a small usually quick project to whip up and this past year I have constructed an assortment. Most are patterns from Cardiff Farms Cottage Keepsakes. The book has a different pincushion for each month and it is often used as for a pincushion of the month club. I am making the ones that “speak” to me. And now there is another book, More Cottage Keepsakes, so that means more voices! Here are a few of the pincushions I’ve made in 2014. 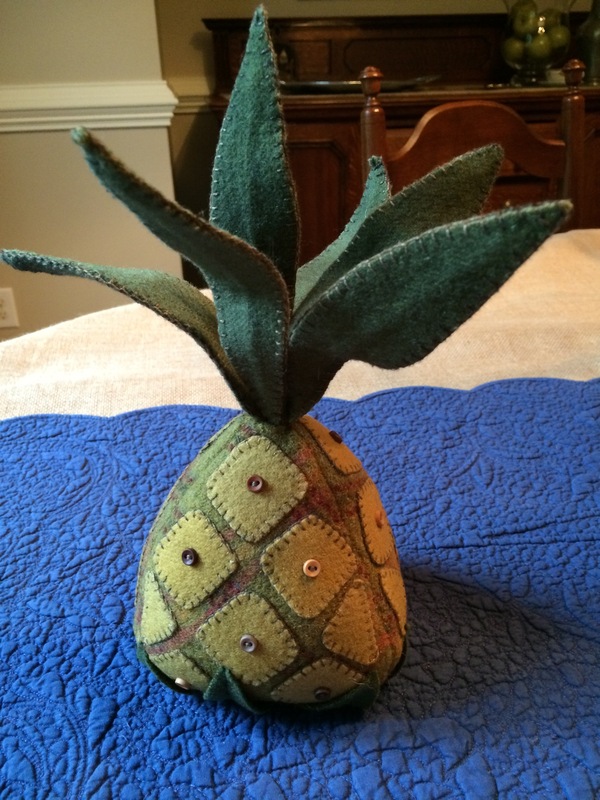 Pineapple cushion made especially for Elfriede Goettel, November 2014. The 3 pincushions in the back are from Cottage Keepsakes. The folded flag came from a Need’l Love book and the rectanglar pincushion in front was a freebie from Primitive Gatherings. Stay tuned, more are on the project board ! Last month I went to Quilt Odyssey in Hershey PA to take a class from Primitive Gatherings, Lisa Bongean. It was a full day class and she schooled us on her method of wool applique with pearl cotton blanket stitch and embroidery. It was informative and I learned a few tricks to add to my basket. Now I need to get the project finished! 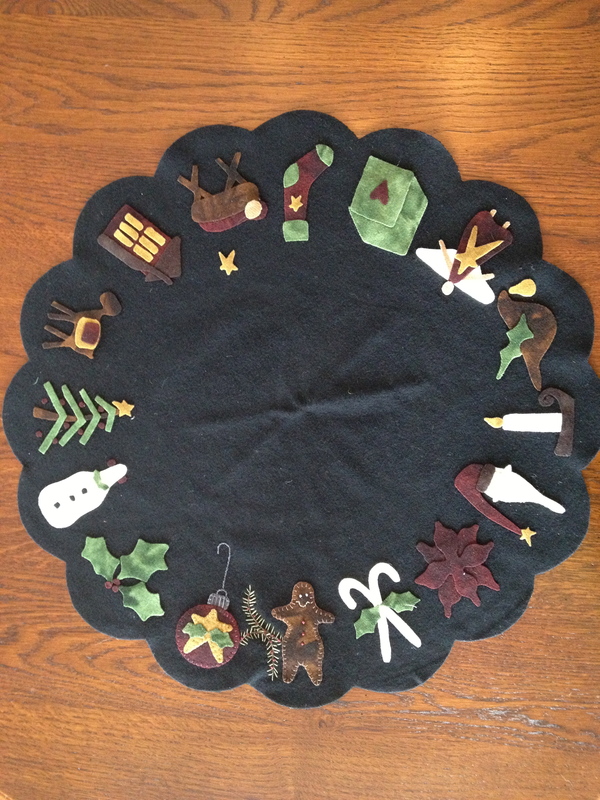 Last night I burnt the midnight oil as I finished prepping the mat for stitching. Here is a close up of the work we accomplished in class. 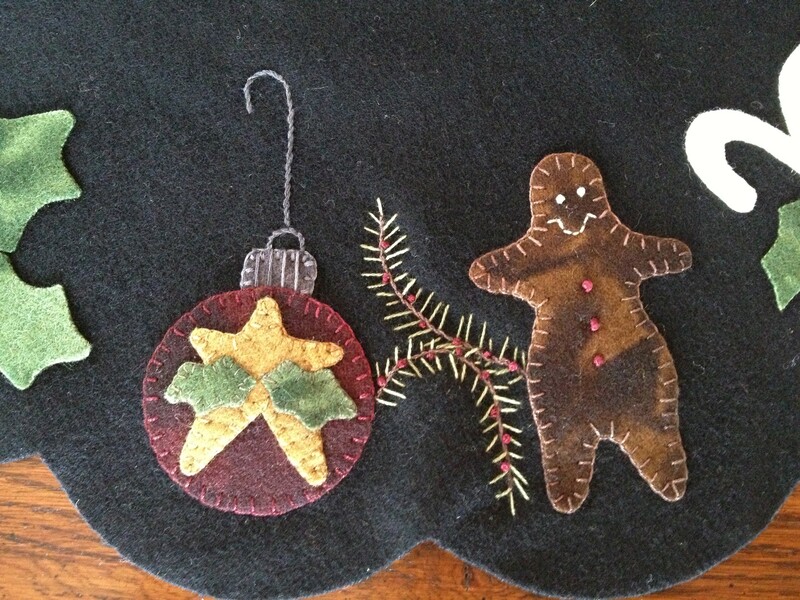 Blanket stitch, stem stitch, back stitch, colonial knots. Hope to get the rest completed in time for the holidays! !